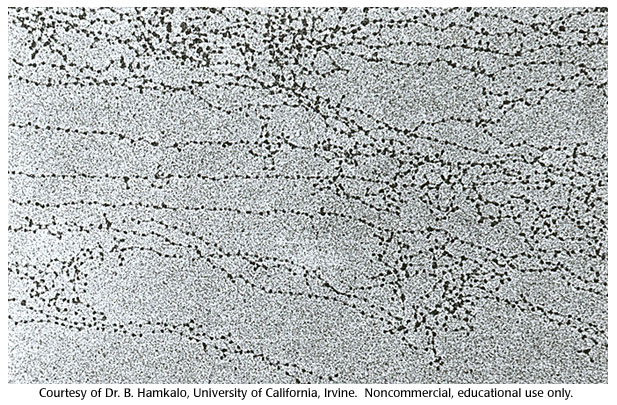 Your first picture shows a chromosome that has been (1) condensed and (2) undergone DNA replication. During G1 interphase (normal cell activity; not dividing), your chromosomes actually do not look like either of the pictures. They look more like a mass of noodles (called chromatin; look at the image provided below); it is only during prophase (step 1 of mitosis, where the cell undergoes division) that the chromosomes condense into the form you have depicted in picture 1. Now, in G1 interphase, you only have single chromosomes. You have 46 of these, which can be grouped into 23 pairs—23 from your father, and 23 from your mother. Remember they aren’t condensed during this stage. In S interphase, DNA undergoes replication, and each of the 46 chromosomes create a double. This double sticks to the original chromosome at a point called the centromere. So long as the two “chromosomes” are conjoined at the centromere, the two “chromosomes” are considered as one chromosome, consisting of two sister chromatids (each like the “single chromosomes” you had previously). 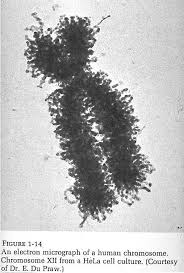 Again, in S interphase, chromosomes are not condensed, and look more like noodles than either one of your pictures. During prophase, the chromosomes look like picture 1. 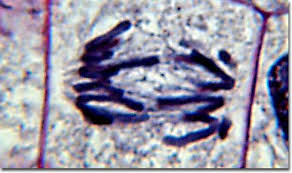 Picture 2 depicts a sister chromatid during prophase (and metaphase), which is considered a chromosome after anaphase (when the two sister chromatids are separated from their centromere). Remember that when the chromatids are not conjoined at the centromere, they are considered each as their own chromosome. Thus, the human body always has 46 chromosomes. They are “double chromosomes,” as you call them, during S phase of interphase to the beginning of anaphase of mitosis. They are “single chromosomes” from anaphase of mitosis to the beginning of S phase of interphase. As most cells spend the most time in G1 interphase (normal activity), you can say that most of the time their chromosomes exist as single chromosomes. Again, note that most of the time they don’t look like your pictures, except for the times that I mentioned above. If during interphase the DNA is not yet condensed and looks like a mass of noodles, then how can we know that there are 46 chromosomes (single ones in this case)? During interphase, it is indeed difficult to tell how many chromosomes there are. It is only when they condense that they become visible to the eye and can be observed through a microscope. Chromatin, in its noncondensed form, is considered as euchromatin—that is, true (noodly) chromatin. When it is condensed, it can be referred to as heterochromatin. We can only count the number of chromosomes when they are in heterochromatin form; euchromatin is invisible to us. If we align all the chromosomes present, we will get something called a karyotype. Look below. 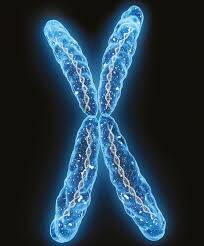 In any case, double or single, we can observe that there are 46 chromosomes at all times. If we see "double chromosomes," we would find 46 chromosomes. If we see “single chromosomes,” we would still find 46 chromosomes. In both cases, we would find 46 centromeres, and ergo, 46 chromosomes. Reece, Jane A., Lisa A. Urry, Michael L. Cain, Steven A. Wasserman, Peter V. Minorsky, and Robert B. Jackson. 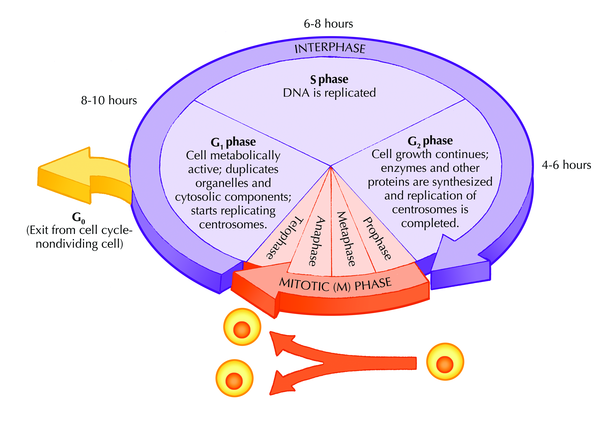 "The Cell Cycle." Campbell Biology. 10th ed. Glenview: Pearson, 2014. 232-50. Print. The first picture you posted represent a pair of chromosomes. The second one represent a single chromosome. Humans have 46 single chromosomes that can be paired in 23 pairs. 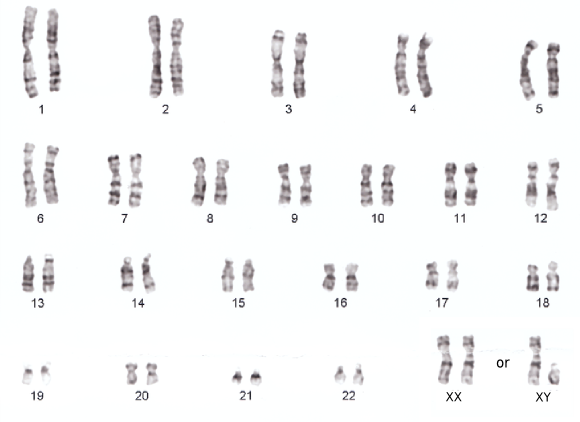 In this picture, https://en.wikipedia.org/wiki/Chromosome#/media/File:NHGRI_human_male_karyotype.png, you can see the 46 human chromosomes grouped in 23 pairs. Note that the last pair is formed by different chromosomes, X (the long one) and Y, so you are looking at the chromosomes of a male. When a cell isn't dividing , the DNA is decondensed. So, you can't say what type of chromosomes are present in non-dividing human cells. 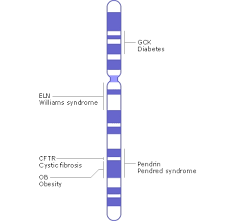 But just to clarify ; it can be said if a human cell's DNA condenses into chromosome(without replication) , it will look like 46 chromosomes of image 2. If it condenses after replication, it will look like 46 chromosomes of image 1. And to clarify your next doubt of what's a chromosome- A chromosome is a structure with centromere present in it. It can have many chromatids in it . For eg- both of your images are a single chromosome. The 1st image has 2 same chromatids in it and 2nd image has one. A chromatid refers to a single DNA molecule. When the human cell is not dividing we have Interphase during which, if we observe inside the nucleus we see a bowl of noodle like structures. Prophase : during which stage the chromatin condense and duplicate themselves, to form your first image. each of this are two chromatids attached to each other at the centromere. Anaphase: the chromosomes are pulled towards two poles, each at opposite ends of a cell. Here we can observe under a microscope your second image. Each of this is a single chromatid. 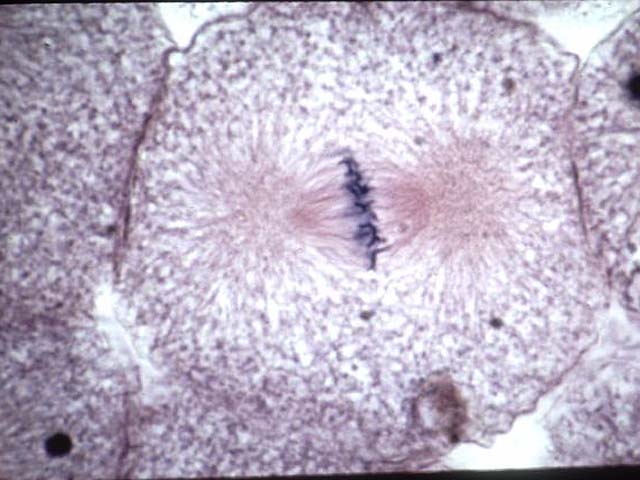 Telophase: contractile ring (a cleavage) starts to separate the two daughter cells. What is the structure and function of chromosomes during interphase? What is the most genetically simple organism except viruses? What are the ploidy levels in major groups of organisms? What is the 'fallacy' in simple segregation rules in reference to polyploidy?